Penang Development Corp's (PDC) property arm PDC Properties Sdn Bhd (PDCP), which has built high-end homes at Bayan Mutiara on Penang island, will embark on three condominium developments with total gross development value of RM671 million. The project, also at Bayan Mutiara, spreads out in three parcels on 7.8ha of land. "The first condo project at Parcel 1 is called 'Mutiara Pica' and is set for launch in October," PDCP chief executive officer Osman Kallahan told Business Times. Construction of the first phase is expected to commence in January 2009 and completed in July 2011. 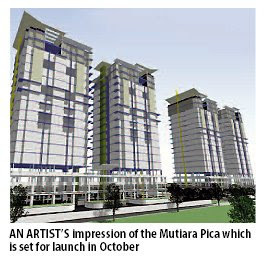 Osman said Mutiara Pica will comprise of 432 mid-range condominiums priced between RM260,000 and RM420,000 per unit. The second and third parcels, which are expected to be completed by 2012 and 2013 respectively, will feature 980 units of high-end condominiums. The Bayan Mutiara development, which is sited on a 40ha site, will boast of high-end homes, affordable housing units, schools, a mosque and a government administrative complex, including the State Legislative Assembly building, when completed. It is also sited within the Penang Multimedia Super Corridor cybercity. Last June, PDC sold a 0.82ha plot to the Inland Revenue Board to build a 16-storey corporate tower there. The Marine Police department has also purchased land totalling 4ha within the development. Other projects on the drawing board for Bayan Mutiara's residential component include the construction of affordable homes and these will comprise low-medium cost and medium- cost apartments. "The affordable units will total 536 with a price range from RM75,000 to RM200,000. "Both projects, which are sited on 2.2ha, carry a gross development value of RM70 million," Osman added, saying that the projects are slated to begin construction in July 2009 and be completed by December 2010. Already under construction by PDCP are its D'Residence bungalow and courtyard homes. March 12, 2009 at 11:45 AMpower PufF!